What is Marine Ich and How to get rid of it? Marine Ich is one of the most common diseases of saltwater fish, caused by the parasite Cryptocaryon irritans. We first noticed this problem when the smallest of our clownfish acquired white spots on him, about the size of grains of salt. He has been acting and breathing normally, with no signs of distress. Upon doing research and calling our LFS we found that this was “white spot disease” or Marine Ich and is very common. The life cycle of this parasite is as such: the “white spots” known as Trophants remain on the fish for 3-7 days in a feeding stage. Next, they fall off and become what is known as Protomont, and settle onto the substrate. They can spend 3-28 days on the substrate where they enter the reproductive stage called Tomonts and produce hundreds of daughter parasites called Tomites. After incubation, hundreds can be released, now called Theronts, and have 24-48 hours to find a host (fish). Then the cycle repeats itself. If not kept under control, Ich can cause breathing problems, loss of appetite, cloudy eyes, and even death. Upon researching treatment options we ran into many, many different opinions and perspectives. We trust our local LFS and have had no problems with them misdirecting us so far, so we gave them a call back and asked several questions about treatment. We posted our questions and concerns to a popular saltwater aquarium forum called Michigan Reefers. Here are the responses we got from our LFS and other aquarists. 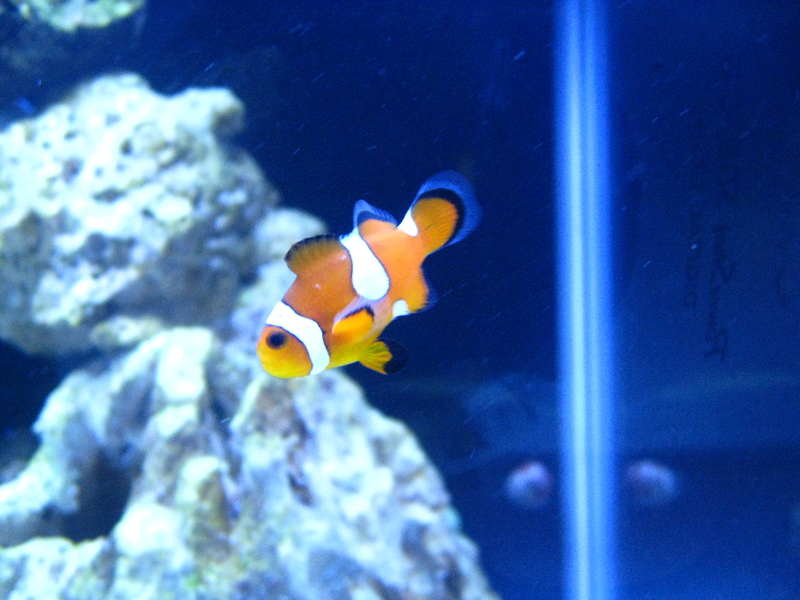 Even with the variety of opinions and debates, we have decided to keep the infected clownfish in the display tank and just keep an eye on him for now. A separate quarantine tank has been set up in case he starts to become worse and needs to be removed from the display tank. We will continue to maintain excellent water quality as well as add garlic to the food we feed. Garlic has been said to increase their appetites and boost immunity. To be honest, I have my suspicions about the use of garlic, and it is, as all topics in saltwater, debatable. However, it can’t hurt and we will give it a try. From here on we will quarantine all fish before putting them in the display tank, as well as consider a UV light in the future. UV lights, however, also have their pros and cons, and both will have to be considered beforehand. This entry was posted in Informational and tagged aquarium, disease, Marine Ich, Parasite, saltwater. Bookmark the permalink. 3 Responses to What is Marine Ich and How to get rid of it?